I'm insane for all the photos you've posted. It takes real restraint not to run out and purchase yarn after seeing them! Wow -- that is some seriously tempting yarn. I love your yarn portraits! What great yarn portraits this week. Beautiful. Your photography skills are through the roof!! Ja, you are an authentic genius! I do believe so, because you are able to make simple things look like Italian renaissance Masterworks! Are you related to Michelangelo or Bernini???? Your yarn portraits are stunning! I even like the blue ones (ok, my bias, generally don't like blue much, but these blues are wonderful). That's the kind of blues I can be happy with. Very nice blue! I enjoyed your series! You've got me drooling over all that gorgeous yarn. And perusing yarn sites... sigh. 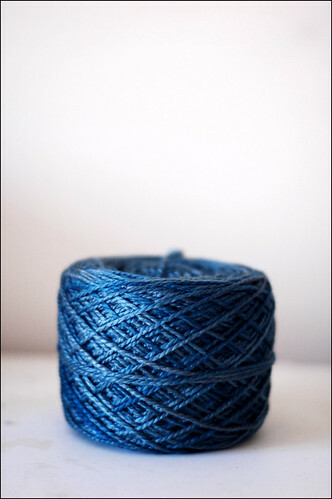 Your yarn is lovely and your pics make them all the more enticing. I am completely green over here... I tried getting my hands on some Sundara but completely missed it. So lovely... I keep going back to that silvery one you posted the other day... Makes my teeth ache it is so pretty. These are crazy gorgeous. Positively luminous!!! tempting and stunning yarns. thanks for sharing. Love the wool but please move on I'm unable to delay gratification. Are you stuck for a project. As soon as one appears everything is wonderfull again.Love your work the photography is top notch. Keep it coming I love seeing what you so. You are so talented. I know you have a whole collection of women who oggle over you and your blog, and I am another one! I love these portraits! I want to cover my apartment walls with them!